Off-grid families in sub-Saharan Africa burn kerosene, wood and charcoal to light their homes and prepare food. In Uganda, where 90 percent of the population is not connected to the electric grid, four out of five households use kerosene lanterns, which are hazardous and unhealthy. They are a major cause of house fires and burns, and together with cooking fires, generate vast amounts of indoor air pollution. The World Health Organization estimates the air inside a traditional African home can have the same amount of pollution as 300 city blocks. Exposure to this toxic smoke causes four million deaths worldwide each year. Women and girls— the primary agents of domestic activities like food preparation—are disproportionately affected. Beyond indoor air pollution, living in darkness increases vulnerability to disease-carrying pests, and the threat of intruders is a constant worry. FINCA is addressing these problems through BrightLife, a social enterprise in Uganda, which distributes and finances solar energy and improved cookstove products for low-income, off-grid customers, especially women. FINCA’s research is studying the impact that BrightLife customers attribute to their products, and initial findings indicate BrightLife products create safer and healthier homes. The majority of BrightLife’s current customers— who are also microfinance clients of FINCA Uganda— are using solar energy and clean cookstove products for domestic purposes. The typical customer is a 45-year-old married, rural woman supporting seven children. Nine out of ten BrightLife customers stated their safety was positively impacted, primarily due to a reduced risk of house fires, burns and robberies. A similar share of customers stated their health was positively impacted, supported by reports of improved eye and respiratory health, and less toxicity. Jane Nakintu’s household is one example. A 65-year-old widow and farmer raising four grandchildren, Jane has been a FINCA microfinance client since 2011. Loans enabled her to purchase fertilizers and seeds, diversify crops, care for livestock, and expand the farm. Jane’s income grew, and she could pay the school fees for her grandchildren. 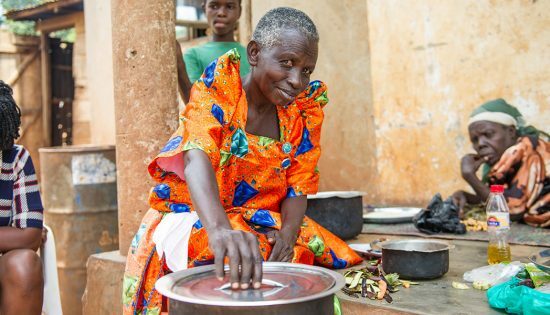 Through BrightLife, Jane purchased a clean cookstove, which uses 60 percent less charcoal than a traditional stove, cuts meal preparation time in half and improves safety and health. The smoke from the wood fire would hurt my eyes, but the new stove is very safe and there is no fire and I can use it indoors. By combining financial services and energy access, FINCA is demonstrating how microfinance can reach deeper into the bottom of the economic pyramid and help women and their families live safer and healthier lives.